The aorta is one of the biggest blood vessels in your heart. Its function is to send blood away from your heart to the rest of your body after it has become enriched by oxygen. Because of how important this vessel is to your heart, aortic diseases can cause serious problems for your health. Aortic disease prevention includes following many of the common practices that are advised for good cardiovascular health overall. This includes maintaining a healthy diet low in saturated and trans fats, as well as keeping track of the blood markers that doctors check to monitor your health. These often include cholesterol, blood sugar and blood pressure. Smoking also increases your risk of heart disease. Regular exercise is also important for preventing heart disease. Your heart is a muscle like any other in your body. Cardiovascular activity gets your heart rate up and causes it to beat quickly, which helps make it stronger. A strong heart muscle can pump blood better throughout your body and is better at fighting off disease. If you already have a medical condition like high blood pressure or diabetes, managing your disease is important to keep your heart strong. Medicine from your doctor can help you manage your conditions and keep your body working the way it should. Aortic Aneurysm: This is the widening or bulging of a portion of the aorta. This is usually caused by a heart condition called atherosclerosis, which means that plaque on the inside of your heart vessels has built up to unhealthy levels. This causes the artery walls to stiffen up and become narrower, preventing good blood flow. If left untreated, aneurysms can sometimes split open, severely damaging your heart and causing possibly fatal consequences. Aortic Stenosis: A narrowing of the left heart ventricle. This can be a genetic condition caused by being born with a bicuspid heart valve (a heart valve that ends in two points). It can also be brought on by rheumatic fever or caused by uncontrolled artery disease. This is usually treated by replacing the heart valve. Acute and Chronic Aortic Dissection: This condition is caused by a tear in the wall of the aorta. The tear allows blood to flow into heart tissue where it doesn’t belong, causing a separation of heart tissue layers and a lack of blood to other areas of your body. This is a very dangerous problem and is often fatal unless treated immediately. Acute aortic dissection is classified as happening in the first two weeks after the condition occurs. After two weeks, it is called a chronic aortic dissection. 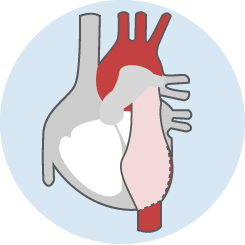 Aortic Rupture: A complication of an aortic dissection or aneurysm, an aortic rupture is when the aortic wall tears open completely. This condition is fatal unless the patient receives immediate surgery. The treatments for aortic disease vary widely based on what kind of heart condition you have. Because of how dangerous heart disease can be, many treatments are aimed at preventing heart disease before it occurs. These involve lifestyle changes to diet, exercise and poor health habits like smoking. When aortic disease does occur in the form of ruptures, dissections or aneurysms, the first treatment is usually surgery. Many aortic diseases restrict blood flow or stop the heart from beating altogether. This makes immediate surgical treatment necessary for the majority of patients who have these heart conditions. Mortality rates are high for patients with aortic disease who do not receive immediate surgery. Depending on how bad the damage is, a heart surgeon may attempt to repair the tissue or may replace vessels and segments that can’t be repaired. After surgery, treatment usually involves rest with small amounts of cardiac rehabilitative therapy. This “heart rehab” is essential to the healing process. Your heart will be weak after the surgery, and will need to be slowly exercised to get it working the way it should. Your doctor will likely prescribe medications that increase your chances of a successful recovery. These can include blood thinners to stop clots from forming or antibiotics. If you have high blood pressure, you may need to start taking medicine to manage that as well. Most importantly, regular follow-ups with your doctor will give you the best possible outcome. Aortic disease can cause many complications for your heart and body. Because of how extensive heart surgery can be, your doctor will need to see you frequently to see how well you’re healing and to know which medications to prescribe.